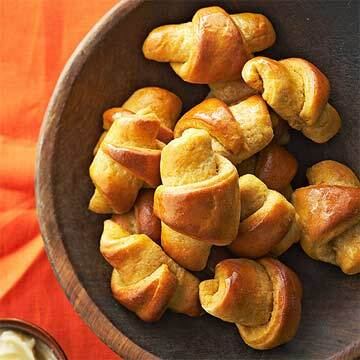 In a medium saucepan heat and stir pumpkin, the water, milk powder, the 6 tablespoons butter, the brown sugar, honey, salt, and cinnamon over medium heat until warm (120 degrees F to 130 degrees F) and butter just melts. Add pumpkin mixture and eggs to flour mixture. Beat with an electric mixer on low speed for 30 seconds, scraping sides of bowl constantly. Beat on high speed for 3 minutes. Using a wooden spoon, stir in the whole wheat flour and as much of the remaining all-purpose flour as you can. Punch dough down. Turn dough out onto a lightly floured surface. Divide into thirds. Cover dough; let rest for 10 minutes. Meanwhile, lightly grease three baking sheets or line them with parchment paper; set aside. On the lightly floured surface, roll each dough portion into a 12-inch circle. Spread with Honey Butter. Cut each dough circle into 12 wedges. To shape rolls, begin at wide end of each wedge and loosely roll toward the point. Place, point sides down, 2 to 3 inches apart on prepared baking sheets. Cover; let rise in a warm place until nearly double in size (about 30 minutes). Preheat oven to 375 degrees F. Uncover and bake rolls, 1 or 2 sheets at a time, about 15 minutes or until golden, rotating baking sheets halfway through baking if necessary. (Cover and chill remaining baking sheet[s] until ready to bake.) Brush tops of rolls with melted butter. Serve warm. Shape rolls as directed in Step 5. Cover with plastic wrap and chill for 2 to 24 hours. Uncover and bake as directed. In a small mixing bowl beat butter and honey with an electric mixer on low speed until light and fluffy.